Irinox is renowned throughout the world as a company specialising in the production of blast chillers and shock freezers. As a pioneer in developing the concepts of blast chilling and high quality storage for the foodservice, confectionery and ice-cream sectors, Irinox has always believed in continuous research and improvement of food storage technology. Innovative in spirit, over the years Irinox has continued to develop leading edge products, offering revolutionary concepts that have set market benchmarks. Irinox was founded at Corbanese (Treviso, Italy) in 1989 as a company specialising in leading edge blast chilling and shock freezing systems for the professional foodservice and confectionery industries. As a pioneer in the industry, Irinox introduced the very first blast chillers, first in Italy and later on international markets. The concept of food blast chilling had already been outlined in France in the 1970's, but back then there was no technology able to preserve the organoleptic properties of food. Our work was at first focused on studying the chemical-physical aspects, so as to understand how chilling technologies could be used while protecting the characteristics of food. We have been able to make blast chilling technology available to all kitchens and to earn the trust of the most renowned international chefs and pastry chefs. Today as in the past, we at Irinox are fully committed to producing blast chillers that offer technology and innovation, and use materials that facilitate the work of professionals and respect the environment. By becoming more and more specialized we have been able to constantly innovate our machines, which are entirely made in Italy, in the province of Treviso, with the same care and attention as the first ones. The great enthusiasm and satisfaction of our professional customers, together with plenty of positive experiences all over the world, have inspired a new project: the Home division. In 2005 we introduced Irinox Home, our first range of built-in appliances for home use. Once again we were pioneers, introducing a new product category and launching Freddy: the first built-in blast chiller. 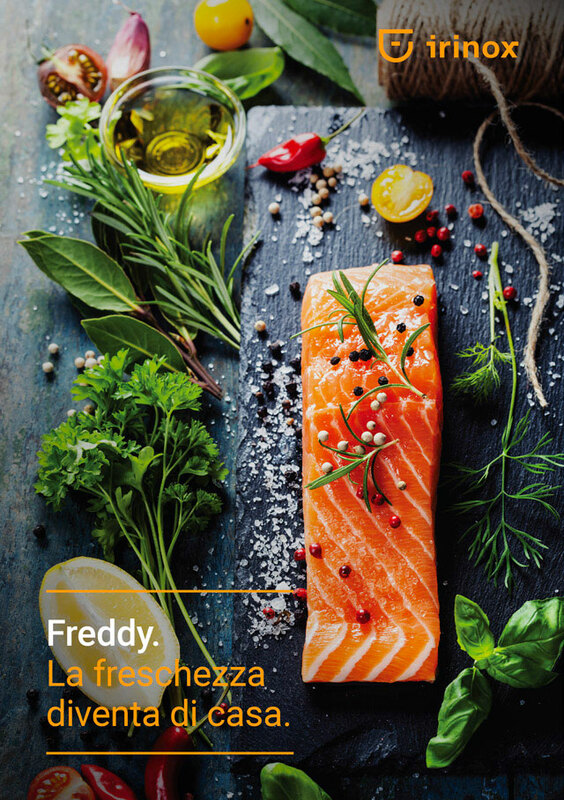 Freddy, the perfect combination of professional technology and minimal design, soon became the flagship of the Irinox Home collection and one of the most innovative household appliances in the world. Our mission is to help those who work with food, both professionals and amateurs, preserve food quality at hitherto unimaginable levels while also retaining nutritional values and organoleptic properties. Irinox Home's dedicated facility, where production, promotion and training activities are carried out, is located at Irinox's historical headquarters at Corbanese di Tarzo (Treviso), against a beautiful backdrop of spectacular hills where Prosecco wine is grown. Irinox's mission is to help people eat more healthily, therefore living better, every day. We encourage a new lifestyle, as it's important to choose clean, healthy food for you and your family, fostering conviviality and minimizing waste. A blast chiller in every domestic kitchen. a world where food is eaten wisely and lovingly as nourishment. What we eat is important, that's why we love fresh natural food. No additives, no preservatives, just what nature creates and our hands process. And rapid chilling helps us to keep vitamins, colours and fragrances intact naturally. We are absolutely convinced that we can help ourselves and our customers enjoy a better way of life through small daily actions in the heart of the family home: the kitchen. Our technology spoils you and your family every day; we know this and feel responsible and happy! Convivial occasions are a good excuse to spend time together; they involve rites and traditions and create opportunities to enjoy company, chat, laugh and joke. Family and friends come together at mealtimes and business is often done at table. Take it from us! Cooking for oneself and loved ones is an act of love that makes us happy. But why renounce all the other pleasures in life because time is short? We at Irinox believe that technology is a valid instrument for doing things well without making sacrifices. Technology frees us from clock-watching. We are well-informed ethical consumers. In the same way as we appreciate the farm-to-table philosophy, we promote a zero-waste philosophy. No raw materials or food must be wasted; our technology makes it possible to preserve them naturally so we can use them over time. In nature there are four seasons. When seasonal produce is ripe it must be consumed, processed or thrown away. If it can't all be consumed, we at Irinox give you the possibility to extend its storage life. Shock freezing is like a taking snapshot of the food's quality, which we can take out and enjoy again after the season has gone. We encourage a new lifestyle. Aware that we are bringing a revolution into the kitchen, we are up front and ready to teach all our customers how to use our machines and get the most out of them, without neglecting personal traditions, schedules and the value of food. Design focuses mainly on reducing the impact of the front, for example by eliminating protrusions and providing an encased handle in anodized aluminium. Another distinguishing feature is the greatly reduced height of the front panel that accommodates a touch display with visible functions and a user-friendly interface. However, the real novelty is the opportunity to customise the front by using a new bonding method that makes it possible to choose different colours, materials and finishes. MM Design has been committed for some time to creating the right mix between industrial and artisan production, in order to boost the enormous potential of products made in Italy. The skills of our craftsmen exalt the materials used to make every product in the Irinox Home collection a unique piece.